I love nature. It is full of surprises. I can recall many times hunting when "what" I was after showed up at the least expected time. One morning I was hunting in a deer stand near Bastrop Texas and had been extremely patient (for a 15 year old) sitting for two hours in this wooden box with windows when I just couldn't take it anymore. I hadn't seen anything all morning but a fox and some black birds and thought if I got out and walked, I could see more and cover more ground. So I quietly got out and walked to the south down a fence row that I had been looking down from the stand. After walking super quietly for about 200 yards, I turned around just in time to see a trophy buck standing 20 feet from my stand looking at me. He hopped the fence and disappeared into the woods never to be seen again. A moment I'll never forget. 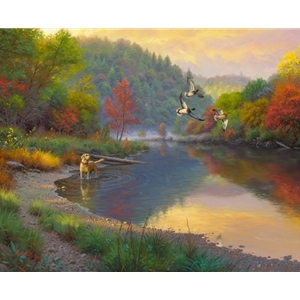 In "Fly By" this yellow lab is dreaming of the day he will get to come back to a spot like this with his companion / owner and enjoy the hunt. I wanted to create this scene for your eyes and your own desire to be "in it" with your dog. Maybe he is there alone, but you could enter the drama -- just pretend you set out some decoys and then turned around to see what might be the closest ducks all day. What ever just happened, this scene is just waiting for you, so grab your thermos of coffee and a dog treat and come sit a spell and watch the magic.